Today I thought I would share a few classics about the backbone of any military – the Sergeant Major. Every old soldier I have ever talked to has tales about sergeant majors and their propensity for yelling. The first is the classic George Formby accompanying himself on his banjo-lele. This clip is from the movie “It’s in the Air”. And the other piece of music is “Kiss Me Goodnight Sergeant Major”. If you want to watch the entire movie the George Formby clip was taken from here is the link (Update: Video removed from Youtube). 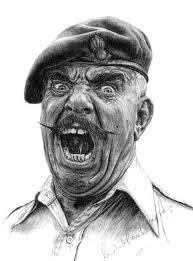 For those of you who remember the classic British comedy series “It Ain’t Half Hot Mum”, here is the very first episode with Windsor Davies playing Battery Sergeant Major “Shut Up” Williams.